The course is completely free, available in Italian and English, and it is divided into 6 chapters. The aim is to provide a tutorial approach to learn the role of space science and technology in monitoring the Earth's surface and atmosphere. Attending the course will let you understand how Remote Sensing is applied to the study of our planet. You will find in it significant images and a glossary to search for specific vocabulary. The course is a collaborative effort of Planetek Italia and IUAV (Architecture Institute of University of Venice), Degree in Geographical Information System, which has an important background in advanced communication systems and Geographical Information Systems. 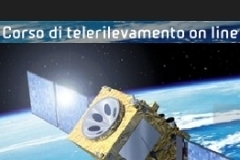 The OnLine Course on Remote Sensing is based on methodology and teaching materials usually used for didactical purposes. Some of this material has been acquired by direct downloading off the Internet, notably from the Remote Sensing Tutorial Online Handbook (NASA/GSFC); we are grateful to all source organizations. No certification of attendance will be released. The content of the course is under Creative Commons license cc-by-nd 4.0 Please note that cc-by-nd 4.0 license does not cover logos, trademarks and images property of other companies.